The 3rd National ISVA Conference ‘Knowledge & Network’, hosted by LimeCulture took places yesterday (28 September 2017) in Manchester. It was another fantastic event with more than 100 ISVAs coming together from across England, Wales and Northern Ireland to share knowledge, learn about topics that affect their practice and network with their peers. 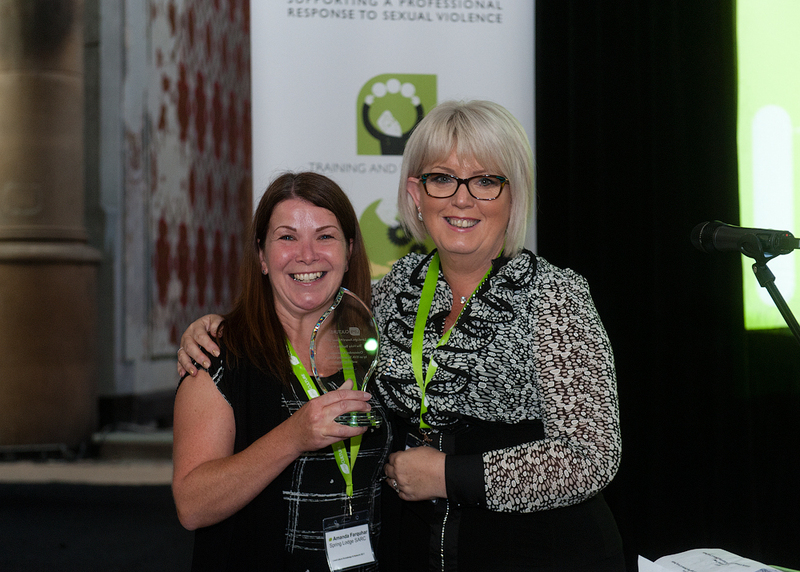 LimeCulture introduced the LimeLight Awards last year (2016) to acknowledge the outstanding contributions and achievements of individual ISVAs, ISVA Teams and ISVA Managers who have demonstrated excellence, dedication and commitment to supporting victims of sexual violence through their work. Baroness Helen Newlove, Victims’ Commissioner for England and Wales congratulated the shortlisted nominees and announced the winner of each category. The winners were invited to the stage, where they were presented with their LimeLight Award – to lots of applause and cheers from the audience of ISVAs. James Seward, Member of the LimeCulture Independent Advisory Board, said of the winner Barbara Pawson “The three short-listed nominees for this award are outstanding, but the winner of this category has made an exceptional contribution to supporting clients and going above and beyond in engaging with her local community making it safe for people to come forward. Award 2: The Vicky Bardsley Prize: Oustanding Achievement by an ISVA Supporting Children & Young People went to Heather Ind of Spring Lodge, Lincolnshire SARC. Unfortunately, Heather was unable to collect her LimeLight Award in person. Heather has recently become a mum to a beautiful baby girl. Congratulations Heather on the birth of your lovely daughter. “All the teams nominated for this award are doing fantastic work and they are all demonstrating the value of working in supportive, close-knit teams. The winning team is well-established, high-performing and making a real impact in their local community”. Award 4: Inspirational ISVA Manager went to Ruth Nash of Ynys Saff (Safe Island) Cardiff SARC. “All the Managers nominated for this award are inspirational leaders who bring exceptional abilities to their teams. However, the award goes to a Manager who has combined the ability to successfully work with partners even at times of pressure with building a safe, nurturing environment to enable her team to develop effectively”. LimeCulture would like to thank everybody who nominated an ISVA, an ISVA Team or an ISVA Manager to make the 2017 LimeLight Awards a great success! We would also like to say congratulations to the other 8 individuals ISVAs and Teams who were shortlisted for the awards across all 4 categories- a fantastic achievement in itself due to the quality of the services provided by the 400 ISVAs and 100+ ISVA Teams working across the UK. Dame Vera Baird QC, Police and Crime Commissioner for Northumbria, chairing the event said that ISVAs are ‘unmatched’ in the support they provide to victims and survivors of sexual violence to meet their needs, including supporting them through the criminal justice process. Baroness Newlove said she was ‘truly honoured’ to present the LimeLight Awards at the National ISVA Conference. She said, “all ISVAs are winners, but the LimeLight Awards are a wonderful way of rewarding the work of exceptional ISVAs’.